A new three-in-one optical element can control light’s amplitude, phase, and polarization through a wedding of old-fashioned holograms and state-of-the-art nanoscale features. Image courtesy of Federico Capasso. "Our lab works on using nanotechnology to play with light," says Patrice Genevet, a research associate at Harvard SEAS and co-lead author of a paper published this month in Nano Letters. "In this research, we've used holography in a novel way, incorporating cutting-edge nanotechnology in the form of subwavelength structures at a scale of just tens of nanometers." One nanometer equals one billionth of a meter. Genevet works in the laboratory of Federico Capasso, Robert L. Wallace Professor of Applied Physics and Vinton Hayes Senior Research Fellow in Electrical Engineering at Harvard SEAS. Capasso's research group in recent years has focused on nanophotonics—the manipulation of light at the nanometer scale—with the goal of creating new light beams and special effects that arise from the interaction of light with nanostructured materials. "When light is radially polarized, its electromagnetic vibrations oscillate inward and outward from the center of the beam like the spokes of a wheel," explains Capasso. "This unusual beam manifests itself as a very intense ring of light with a dark spot in the center." "It is noteworthy," Capasso points out, "that the same nanostructured holographic plate can be used to create radially polarized light at so many different wavelengths. Radially polarized light can be focused much more tightly than conventionally polarized light, thus enabling many potential applications in microscopy and nanoparticle manipulation." 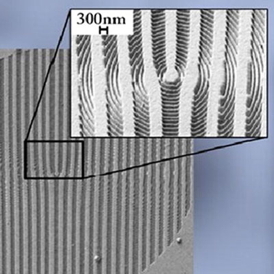 The new device resembles a normal hologram grating with an additional, nanostructured pattern carved into it. Visible light, which has a wavelength in the hundreds of nanometers, interacts differently with apertures textured on the ‘nano' scale than with those on the scale of micrometers or larger. By exploiting these behaviors, the modular interface can bend incoming light to adjust its intensity, phase, and polarization. "Now, you can control everything you need with just a single interface," says Genevet, pointing out that the polarization effect the new interface has on light could formerly only be achieved by a cascade of several different optical elements. "We're gaining a big advantage in terms of saving space." Genevet's and Capasso's collaborators included co-lead author Jiao Lin, a former SEAS postdoctoral fellow who is now at the Singapore Institute of Manufacturing Technology; Mikhail Kats, a graduate student at Harvard SEAS; and Nicholas Antoniou, principal focused ion beam engineer at the Center for Nanoscale Systems at Harvard University.